Contest 1. $25.00 Amazon gift card. The winner has been contacted. I will be putting their name up as soon as everything is in order. You accrue winning points by doing any of the following. The more points, the better your chances. You will win The Guardian Poster before it's available at the Zazzle store. The next ones can tally up points fast. But I have put a limit of once per day / per site, I don't want anyone to accidently becoming a spammer. Tally up what you have done. If you have linked your blog to mine, make sure to give me the url or your blog, so I can return the favor. In the event of a tie, winner will be chosen by random drawing. *The interview does not have to be done in April. But can be sceduled for a later date and still count. We still have two other contests going on! 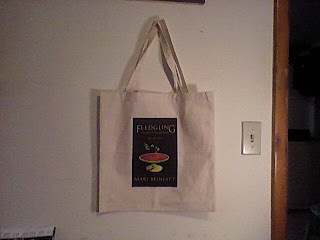 If you have read the book: Send me a link to your review of Fledgling. This review can be on your blog, Amazon, Goodreads, etc. If you haven't reviewed it yet, please do. Yes, even a "bad" review will count. Winner get to have their name as a character, that gets killed off in Patriarch. Take a photo of you, or have someone take a photo of you reading Fledgling in PUBLIC. If using an Ebook reader, please show the title page. Send me an email with the photo: mariminiatt (at) Gmail dot com Subject: Photo Entry. I will upload the photos here. One random person will be chosen to win a Fledgling Book Bag. Now for some of the nitty gritty. Contests 3 and 4 is for people in the United States. The poster is a digital copy of original piece of art work, done by Matt Miniatt, illustrator for the Coiree Guardians. The poster and the book bag will be shipped only in the US. How I determine the random draws. Each entry is assigned a number. I will go to Random.org to generate the random number.